We Will Expand N-Power, School Feeding‚ TraderMoni, MarketMoni‚ Power, others. VP Osinbajo stated this at the 9th Bola Tinubu Colloquium Themed: WORK FOR PEOPLE, at the international conference center, Abuja, on Thursday. According to Vice President Osinbajo, “At the Next Level, we will, of course, expand our social investment programmes; at the moment, the programme is the biggest of its kind anywhere in the African continent. It is a very important programme for us also because of the multiplier effect on agriculture and also in the distribution of the products and also those we employ as cooks. programme, a component of our Government Enterprise and Empowerment Programme [GEEP], where we are giving money to the bottom of the trading pyramid in Nigeria. 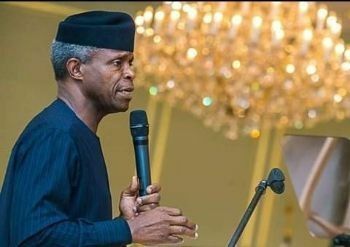 You can read in details:REMARKS BY HIS EXCELLENCY, PROF. YEMI OSINBAJO, VICE PRESIDENT OF THE FEDERAL REPUBLIC OF NIGERIA, AT THE HTH BOLA TINUBU COLLOQUIUM THEMED: WORK FOR PEOPLE, AT THE INTERNATIONAL CONFERENCE CENTRE, ABUJA, ON THURSDAY, 28TH OF MARCH, 2019.